793 HP Stroker Miata on M.net - Page 2 - Miata Turbo Forum - Boost cars, acquire cats. 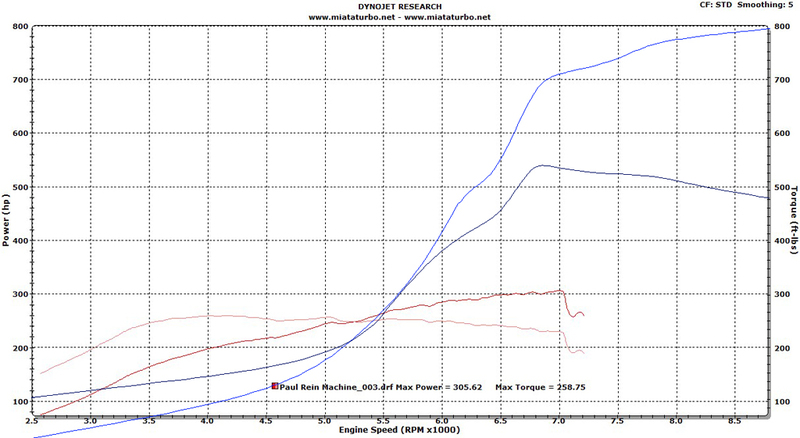 The stroker is taking 30 psi to 8700rpms, seems to be really bulletproof. How the hell does he find traction on R888´s, I don´t know. If I lived somewhere that type of power/speed was "accepted" on the streets, I'd be dead. That's an insane amount of power out of that motor. At first I thought it would not be very driveable when I saw how late the turbo hit full boost. But, then I saw the redline; The 8700 rpm redline gives the engine about 2200 RPM range of fairly flat peak power. Hell call it a 3300 RPM wide powerband of insane 400+ horsepower. Not much worse powerband width overall than any other turbo bigger than say a 2871. With that steep torque curve that thing must hit like a freight train. In a word, awesome. What's up with torque and HP crossing at 7500 rpms? Maybe I'm in idiot for asking but I thought that was consistent at 5200. The dyno plot won't load on my slow *** phone connection, but I'd guess it's because they measure horsepower in different units over there. Still a function of torque, but a different equation. So does how much power would this thing be throwing down on a dyno here if that's the case?? Holy *****, that must be a wild ride after 5500 rpm lol. not only are HP and TQ not to scale, they are measured in different units. Math fail. lol, I'm bored as **** this morning so I am going to put my 320/305 chart and his 793/550 chart onto the same graph in excel. Last edited by Savington; 11-28-2009 at 01:48 PM. Big cylinder head, big camshafts. I wanna see what he did to this head to make it flow well at nearly 9000 rpm. Aren't these heads notorious for dying out at high rpm? There is a reason alright, nobody uses a big camshaft. The miata head flows better than some NASCAR heads. He was man enough to get the combination right and not use a ***** cam.